I am currently working on a project that makes me so happy, I can hardly stand it! It almost feels too good to be true. I eagerly anticipate opening night on Oct 2, 2015, in collaboration with some of my favorite people on earth, the Sanctuary of Hope (SoH) family of Kenya. They will sleep deep in the night halfway around the world as the gallery opens; but they will be ever-so–present in art, photos, and stories. 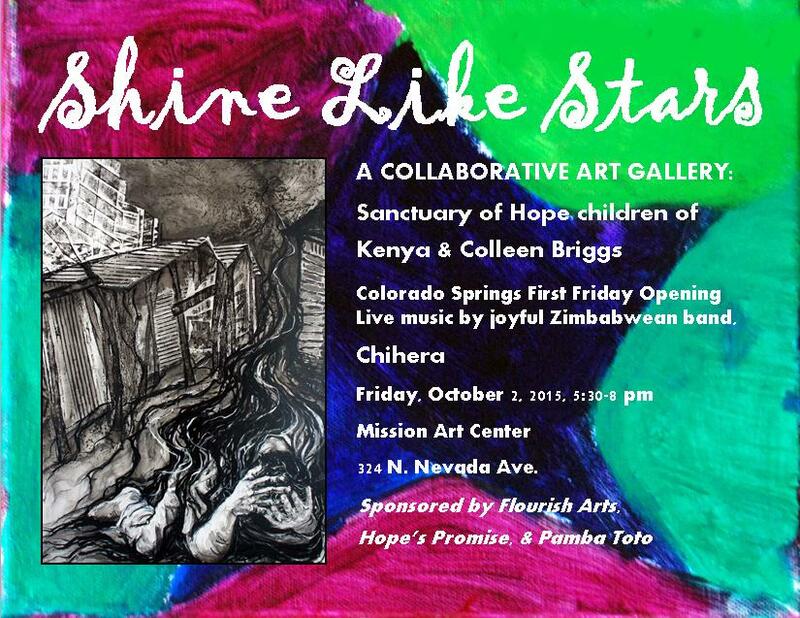 I am privileged to partner with dear friends to bring this event about: the dancers of Flourish Arts, Colorado Springs, helped hang the show in their studio space and will host the opening; my Pamba Toto co-founder Debbie Lee implemented the project by carrying canvases gessoed by Penny Taylor over to Kenya and bringing back glorious paintings last month; the Hope’s Promise Kenya Country Support Team will help host; Hope’s Promise is spreading the word and will be present to share more about SoH; and incredibly talented musician friends from Zimbabwe, the band Chihera, will flood the gallery with joyful music. Please come if you can! And if you can’t, keep reading to catch a glimpse of the magic. 153 million orphans scattered across the globe. If we allow the heart of God to inhabit our flesh, and if we start with the children God brings to our attention, one by one, we can restore them to the constellation for which they were designed: the love and nurturing of family. Then, they (and we) will shine like stars. 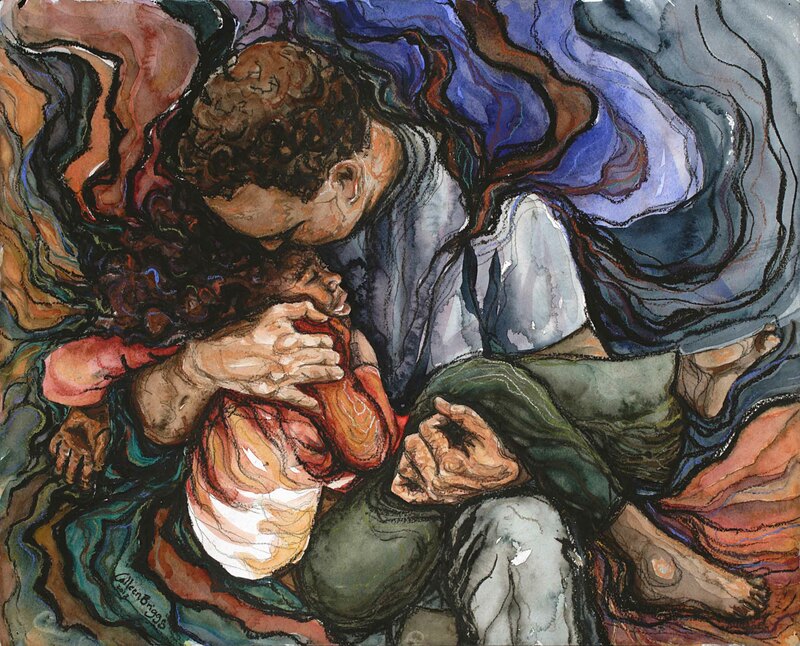 Rescue; 2010-2012; 19″ x 27″; mixed media: collagraph, ink, pastel, charcoal. Here, in this gallery, you will meet the 24 brilliant stars of Sanctuary of Hope. These children once faltered in Mathare Valley, second largest slum in East Africa and home to half a million people living in six square miles of abject poverty. While pastoring churches in Mathare Valley for 25 years, Kenyans Pastor and Mama Karau witnessed first-hand the abuse and neglect of orphans. Together with friends in the US, they began to rescue these children in 2006 through the orphan care ministry of Colorado based non-profit Hope’s Promise (HP). Today, twenty-four former orphans are loved and nurtured between two homes, Sanctuary of Hope (SoH) #1 and #2. In contrast to institutional orphanages, where residents simply receive food and shelter, SoH children grow and heal in close family relationships. Motivated and sustained by their faith in Jesus, Pastor and Mama Karau and the SoH caregivers care for the children as their very own. Both of Janet’s parents became very ill with HIV+. They were starving, weak, desperate enough to wish they were no longer alive, and dependent on hand-outs from others. Unable to care for Janet, she was passed around to various relatives. Janet came home to SoH at age 6. From the beginning, she was very responsible,attentive, neat, and helpful. Still the peacemaker at age 14, Janet avoids conflict and helps her siblings find resolution to disagreements. She prefers to stay in the background, but attracts many friends with her sweet personality. Janet loves to read. Sweet Laban sometimes disappears for long periods of time, only to be found somewhere quiet, reading his Bible. Quiet, safety, and space to seek God were once an unlikely dream. Soon after Laban and his twin brother were born, their mother, sick with HIV, begged Mama Karau to take care of the babies when she died. She lived with the twins’ older brother, also HIV +, and her HIV+ sister in the desperate environs of Mathare Valley slum. When SoH #2 opened in 2008, Laban and Michael were the first children to come home. Now ten years old, Laban is hard-working, amiable, and a natural leader. Even though he is one of the youngest children in the home, he likes to organize his SoH siblings into group games. Recently he wrote a letter to God and asked his caregivers to mail it for him. They marvel at his “amazing faith” and his desire to grow closer to God. Meet Esther! With a big smile, Esther is a sweet and happy girl. Her SoH siblings love to take care of her, and she eagerly soaks up the attention of her care-givers. Nine years old now, Esther can run and communicate with simple words. These accomplishments were once an unlikely dream. Esther was born under-sized and weak in Mathare Valley. Sometimes the best a mother can hope for a sickly baby born into the desperation of a third world slum is that the child will die. Esther defied the odds. She spent much of her early years in the Mathare Worship Centre daycare. When Esther was two years old, she was photographed in Debbie’s arms by a Nairobi newspaper. The Kenyan reporter noted Esther’s protruding belly as evidence of malnutrition; and in the article, Debbie pleaded for someone to help the child. At age five, Esther still could not walk or speak. She rarely, if ever, smiled and her eyes appeared vacant. Moved by her plight and with the support of various friends who met Esther in Mathare Valley, Pastor and Mama Karau rescued her into the Sanctuary of Hope family in 2010. A photograph taken within weeks of Esther’s homecoming shows her laughing on Pastor Karau’s lap. Soon after, she took her first steps to the gleeful cheers of her new family. Pamba Toto is a for-profit business founded to generate funding for SoH. Pamba Toto products include jewelry and house-wares crafted by economic development projects in Kenya. Profits are donated to Hope’s Promise for SoH. Pamba Toto implemented the “Shine Like Stars” painting project this past summer. As well as being displayed at awareness exhibitions, the paintings will be sold at a silent auction fundraiser for SoH in Colorado Springs in summer 2016. Flourish Arts utilizes life-affirming creativity as a conduit for healing, bridge building and community transformation. As a relatively untapped resource for proactive change, the arts, in all their raw vulnerability and beauty, profoundly unite the aesthetic with the intellect, emotions and spiritual beliefs of all humankind. 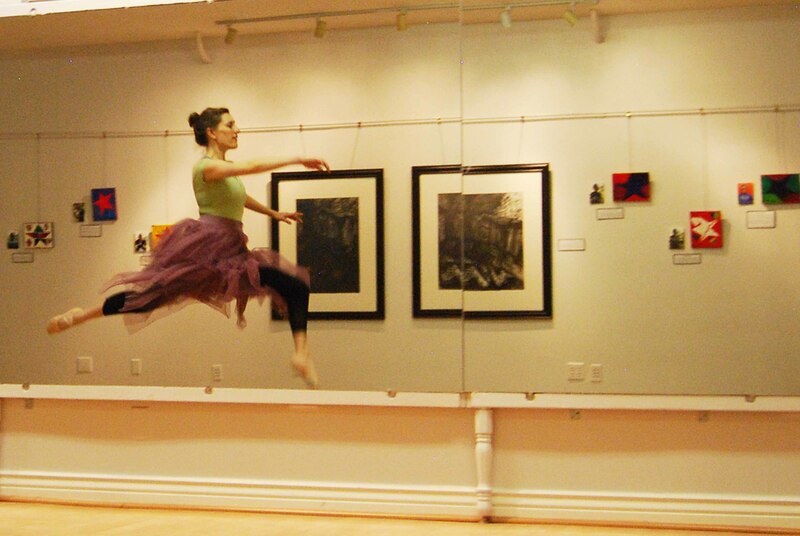 Maintaining a three-fold focus: the Fine Arts, Dance and a Community Arts Program, Flourish Arts strives to inform, inspire and engage community through relevant creative expression. Thank you for making a difference in my day. Hoping the amazing natural “art” of Moab is feeding your soul!